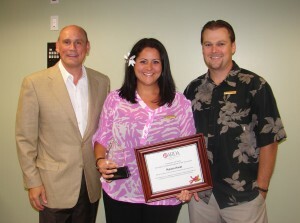 The American Resort Development Association of Hawaii (ARDA-Hawaii) has announced the winners of its first annual “Timeshare with Aloha” Awards, with Keani Awai, Marketing Manager at Marriott’s Maui Ocean Club, taking the prize for the island of Maui. ARDA-Hawaii established the Timeshare with Aloha Awards this year to showcase and reward committed industry professionals who make Hawaii a special place to visit. Awai, a resident of Wailuku, has been with the Marriott Vacation Club for nearly 16 years, and was selected from among numerous nominees from Maui’s resort and timeshare properties. She is described by her nominator, Brody Long, Director of Marketing for Marriott’s Maui Ocean Club, as an employee whose presence is undeniable by those who have the pleasure of meeting her. For more than 15 years she has greeted guests and associates with a beaming smile and an affectionate hug. She also strives to share the beauty of Hawaii in unique and impressionable ways. Awai’s professionalism was also noted by the judges. “Keani has great customer service and has demonstrated eagerness to learn and work hard,” said Maui County Council Member Gladys Baisa, who was a judge for this year’s awards. (L-R) Brian Miller – Executive Vice President & Chief Sales & Marketing Officer for Marriott Vacations Worldwide, Keani Awai – Marketing Manager at Marriott Vacation Club, and Brody Long - Director of Marketing at Marriott Vacation Club. For the awards, one outstanding employee each from Kauai, Oahu, Maui and Hawaii were recognized and received a two-night stay at a Hawaii timeshare resort and $1,000 to spend during their awarded vacation. The nominations, which included submissions from supervisors and peers, were reviewed by a panel of judges comprised of community and government leaders and experts in the travel and hospitality industry. The judges evaluated the submissions based on the candidates’ dedication at the workplace, relationship with coworkers, customer service and community stewardship. ARDA-Hawaii is the local chapter of the American Resort Development Association, the national timeshare trade association. 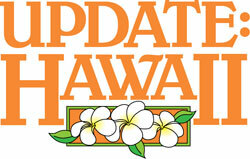 Timeshares account for 13 percent of Hawaii’s visitor lodging inventory and thousands of jobs. 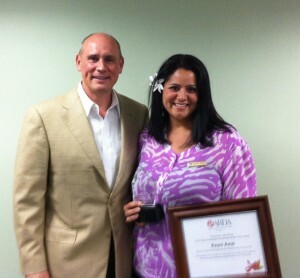 Learn more about “Timeshare with Aloha” at www.ARDA.org/alohaawards.